I created a quick video that shows why you cannot use ‘go’ inside sp_executesql. From time to time, you will have to create some Dynamic SQL to create scripts that are used in SQL Reporting Services or something along those lines. However, when you want to add readability to the dynamic SQL scripts, you’ll have to add line breaks. Here is a simple example, which sets the database. Something is awry, and it turns out that SQL Server is looking for a carriage return CHAR(13) and a line feed CHAR(10). The example below will execute successfully. 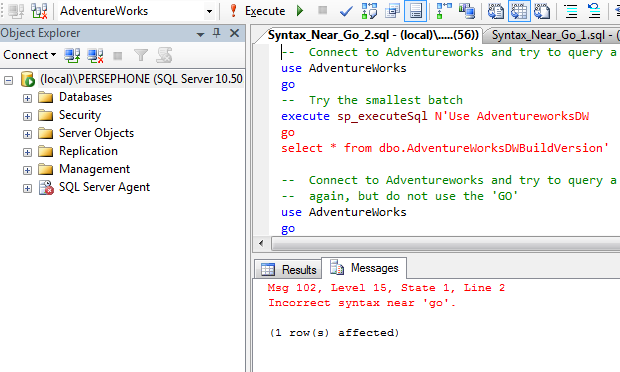 With the Carriage Return and Line feed in the Dynamic SQL, your query should execute. Source from MSDN SQL Server Forums. I was not using the code to feed sp_executesql so I did not test for that. For you folks using sp_executesql, I would say leave out the GO statements for now, if possible.